Tellwut launched its mobile optimized online survey tool May 2014 during Canada Music Week 2014, as a sponsor for the event. 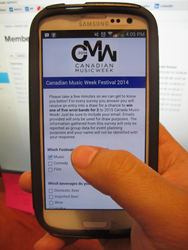 Tellwut launched its mobile optimized online survey tool feature at Canadian Music Week 2014 (CMW), which was hosted in Toronto, Ontario. As a sponsor for the event, Tellwut designed surveys and gathered data that CMW will be able to use to optimize sponsorship for 2015. Attendees of CMW’s summit along with a sample of CMW Festival goers participated in online surveys given by the Tellwut staff via mobile smart phones, tablets, embedded surveys on landing pages, and through various other web devices. Tellwut also engaged CMW attendees by pushing quick polls through social media, like twitter. Tellwut launched this fundamental technology feature as mobile optimization for all devices is essential when maximizing user engagement. Recent studies have shown that mobile platforms now contribute to nearly 45% of overall time that is spent on the internet, surpassing desk top access according to marketingcharts.com posted March 5, 2014. Web usage for mobile platforms is growing exponentially with the abundance of smart phones and digital tablets in the marketplace. Tellwut is excited to announce the flexibility of its online survey tools when adapting to mobile usage which integrates with tablet, Android, IPhone, and Blackberry technology. Once you create an online survey with Tellwut, the appearance will automatically adapt to the mobile device the receiving end is using. Mobile optimized online surveys provide substantial convenience to your customers, employees, and stakeholders. Tellwut’s mobile optimization feature allows responsiveness to all web based platforms without compromising image appearance and user performance while heightening user engagement for critical market research studies. Tellwut provides online survey tools coupled with a community of respondents; providing quick and easy self-serve solutions for online market research needs. The Tellwut respondent panel is a significant North American online forum of individuals dedicated to expressing their opinions through online surveys based upon a wide variety of topics in exchange for rewards and the Tellwut community experience. The Tellwut community and proprietary online survey and reward software application provide a platform for organizations to send surveys to their stakeholders or to crowdsource and conduct online market research through the use of the Tellwut survey platform and the Tellwut Community; thus allowing businesses a clearer understanding and insight into their products or services, customer sentiment and potential business opportunities.